After working as a security officer for 20 years, Christy Price was hoping to retire early. But when her employer cut her hours, that hope went out the window. Price, 60, must work 40 hours a week to qualify for her job’s 401(k) plan, but her on-call status prevents her from reaching that bar. She puts in between 32 to 36 hours, relying on unemployment to fill in the gaps, but would rather work full time. Supervisor Eric Mar introduced new legislation July 29 to make life a little easier for Price and other retail workers at San Francisco’s 1,250 chain stores. 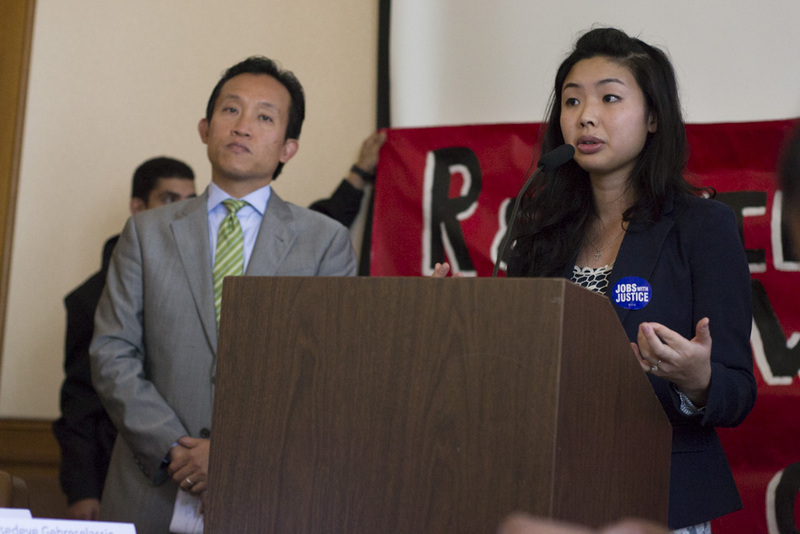 The ordinance, co-sponsored by supervisors David Chiu and John Avalos, is dubbed the “Retail Workers Bill of Rights” and will beef up protections for employees working at formula retail businesses—defined as those that have 11 or more stores nationwide. The city attorney’s office is looking into amending the ordinance to ensure fair work schedules for contracted security officers and janitors who work at formula retail businesses, said Jane Martin, a union organizer for SEIU United Service Workers West, which represents security officers and janitors. These protections will require employers to offer full-time hours to part-time workers before hiring more part-time workers. It also calls for predictable work schedules, job security and pay for on-call workers during the time they are expected to remain available. Mar has been working to zero in on the key issues retail workers face with his brother Gordon Mar, executive director of Jobs with Justice San Francisco. The advocacy group found that workers struggle to make ends meet primarily because they are barred from working a full-time schedule. This is the first local fair scheduling ordinance and is part of a new national trend. Recently, U.S. Rep. George Miller, D-Martinez, introduced the Schedules that Work Act which would introduce the same protections nationwide. The trend of involuntary part-time status is on the rise, with 7.3 million people in November 2008 working less than 40 hours, according to the U.S. Bureau of Labor Statistics. Brian Quick couldn’t get beyond 35 hours a week at Old Navy. To pay the bills, these workers often take multiple part-time jobs—a set-up for trouble if they are required to be available on an on-call basis. At one point, Julissa Hernandez was juggling three part-time jobs. “It was super hectic,” Hernandez said. Every week her schedule would vary widely, and she would have to juggle childcare and her mother’s doctor appointments with no advance notice. Supervisor Mar said the ordinance is designed to keep “low-road” employers like Walmart out of San Francisco, along with the practice of cutting workers’ hours to slash costs. If the Retail Workers Bill of Rights passes, formula retail stores will be required to post employee schedules in advance and give reasonable notice for any changes. That means a lot to Malene Allen, whose hours at Macy’s have been changing with little notice. Allen, who has worked at the Union Square store for eight years, said even though work schedules are supposed to be issued two weeks in advance, she never knew what to expect. She has been asked to come into work with no warning at all on her day off. “How do you have a life outside of work without a steady schedule?” Allen said. The Board of Supervisors will begin holding public hearings on the proposed ordinance in September, but for people like Price, the ordinance can’t be passed soon enough.